Ready To Love Your Carpets Again? If you want your carpet professionally Deep Cleaned the Hypo-Allergenic, Non-Toxic, Odor Free, Eco-Friendly way, and you want your carpet to be Completely DRY Within Minutes… then we’re your new carpet cleaning service! 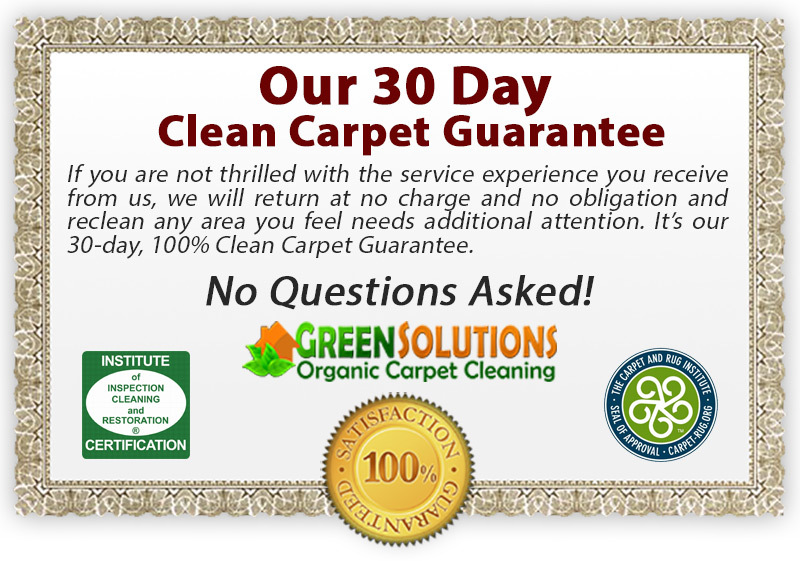 We specialize in Low Moisture, Organic Carpet Cleaning that’s cleaner, safer and 100% Guaranteed! How Do We Provide A Superior Carpet Cleaning? We power vacuum your carpets, lift the pile and dry extract all loose soil, particulates, dust and allergens. We pre-treat all obvious spots and stains. To deep clean your carpet while removing allergy-causing contaminants, spots, stains and particulates, we use specialized deep extraction carpet cleaning equipment that thoroughly cleans and extracts from the bottom up while complying with manufacturers’ recommendations and warranty requirements. 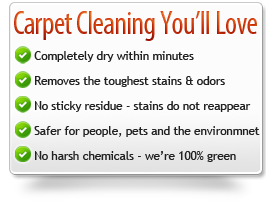 Your carpet is then professionally groomed and will be completely dry and ready to use in less than an hour. Is This Carpet Cleaning Method Really Effective? Take a look at the before and after images below and decide for yourself. If we can restore carpets like these, you can rest assured, we can provide the quality of carpet cleaning you want and deserve for yours. But What About Pet Stain And Odor Issues? We’ve got you covered! 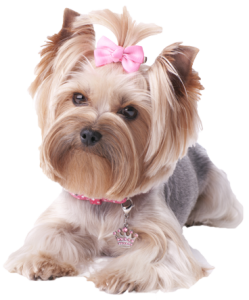 In fact, we probably get more calls and questions about pet accidents and the associated odor issue than all other services combined. We know exactly how to deal with this and permanently eliminate the problem. The primary reason to have your carpet cleaned is because sooner or later it becomes obvious that it just needs a good thorough cleaning, right? That’s one reason to schedule a professional carpet cleaning – and it’s a good one. But it’s also important to realize that professionally cleaning your carpet on a regular basis provides some serious health benefits as well. Carpets in your home or in your office, can quickly collect unseen particulates, bacteria, dust mites and pollen and other allergens that can’t be completely removed by vacuuming. Although not visible on the surface, these substances can have an effect on the air quality that you and your family breathe while indoors. Merely vacuuming and even using household carpet cleaners to remove the obvious dirt and spills is not enough to ensure the air you’re breathing is as clean as possible. By investing in a professional carpet cleaning by Green Solutions Dry Organic Carpet Cleaning, you can rest assured that our commercial grade, advanced equipment and non-toxic, eco-friendly cleaning products will give your carpets the deepest and most thorough cleaning possible. You’ll love the way your carpets look and feel… We Guarantee it! According to the carpet cleaning industry estimates, there are about 200 Billion square feet of carpet in the United States. Cleaning all of this carpet just once with a Dry Extraction Cleaning System would save 9 Billion 770 Million gallons of clean usable drinking water! Another huge point that is always overlooked is that wet extractors (HWE / Steam Cleaners) use extremely large amounts of water to clean your carpet. Further more, they generate extremely large amounts of contaminated waste water which burdens sewers and our water treatment facilities. Also, 20-35% of waste water that is left behind in the carpet and padding evaporates, which then starts humidifying buildings and forcing air conditioners and dehumidifiers to run harder and longer wasting more valuable energy. Using Dry Extraction Compound Cleaner saves water. 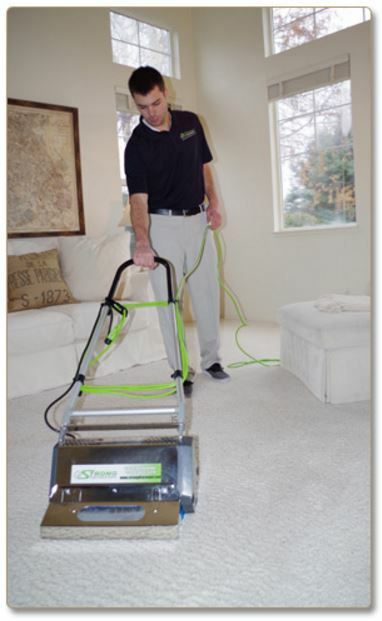 In fact, the Strong Dry Carpet Cleaning System we use at Green Solutions in Salt Lake City, deep cleans carpets better with 97% less water than typical high-flow wet truck mounted carpet extractors. We are convinced that once you use our Dry Organic Carpet Cleaning system, you will never go back to the old, dated, unsafe carpet cleaning methods of the past! We guarantee it!